Some of the top MBA programs in the world are adjusting their curriculum after last year’s mania around bitcoin. Stanford Graduate School of Business, Wharton School of the University of Pennsylvania and Georgetown University’s McDonough School of Business are expanding classes in digital currency and blockchain to keep up with demand from students and their future employers. Stanford’s business school, ranked No. 1 in the world by the Financial Times this year, is adding a new full-time course in May. The class, called “Cryptocurrency,” was a grass-roots effort by students, according to one MBA candidate. Itamar Orr, a second-year student leading the charge to create more crypto-related courses, said there were a few of them at Stanford but none of them were continuous. When the Israeli native realized there were no crypto courses listed for 2018, he rallied 12 classmates and sent a letter addressed to professors and associates of the business school. Stanford agreed and added the course, which closed with more than 50 people on the waiting list, according to the university site. Part of the interest comes from Stanford’s funnel into venture capital. Of the 32 percent of MBA graduates who chose to go into finance, 7 percent went to venture capital, according to the university’s 2017 employment report. VC was the second-most-popular choice behind private equity at 15 percent. Only 1 percent of graduates went into investment banking. Interest from Stanford students has increased in lockstep, according to Susan Athey, the technology professor at Stanford Graduate School of Business who teaches the new class. Athey, who is also on the boards of Ripple, Lending Club, Expedia and Rover said the curiosity is partially thanks to bitcoin. 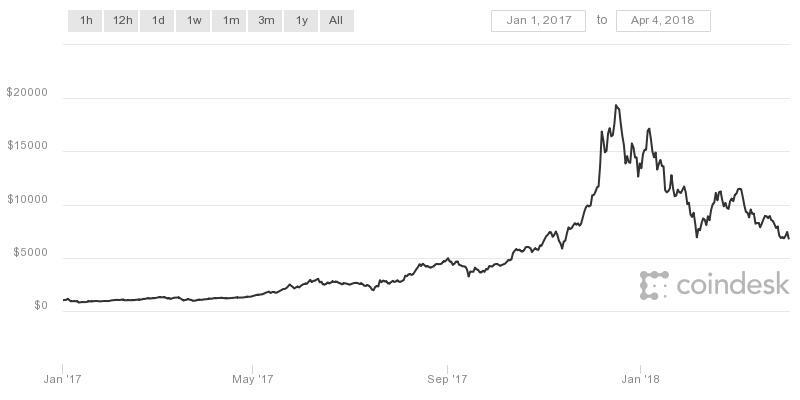 Bitcoin rose 1,369 percent in 2017, nearing $20,000 in December. The cryptocurrency was trading below $7,000 as of Wednesday and is down more than 50 percent this year. Blockchain is the distributed ledger technology that underpins cryptocurrencies such as bitcoin. Banks such as J.P. Morgan Chase and companies such as IBM are testing its use for payments and other activities. Wharton, which is ranked No. 1 by Forbes and No. 3 by U.S. News and World Report, is also adding a class in the fall. “Blockchain, Cryptocurrency, and Distributed Ledger Technology” will be taught for the first time as of 2018 by professor Kevin Werbach. There was no question of student interest in blockchain and crypto at the Philadelphia business school, Werbach said. But before adding a course, he needed proof that cryptocurrency and blockchain was more than a fad, and was relevant to business students. Werbach pointed to Wharton alumni working at crypto and blockchain start-ups Ripple, Bitmain and Coinbase, all of which he guessed would recruit students who eschew careers on Wall Street. It’s not just venture capital and cryptocurrency exchanges looking for a deep knowledge of blockchain.